If you’re a UFC fan, this is going to be of interest to you. Double that if you also love poker. Today PokerStars is launching new UFC-branded Spin & Go’s. 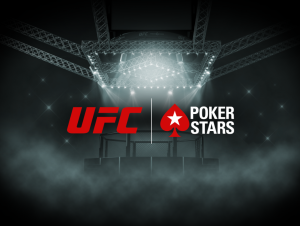 They’re part of the exclusive global poker partnership between PokerStars and the UFC, the world’s premier mixed martial arts organisation. There’s a lot to say about it, and you can read on to learn more of that below. But here’s what you can look forward to. It makes today the start of an action-filled 2019. What are new UFC Spin & Go’s? Spin & Go’s are three player poker tournaments. They have a hyper-turbo structure which means levels are short and action filled. They’re quick. Whether that’s Henry Cejudo quick or Amanda Nunes quick is up to you. The spin at the start of the game. That’s what determines the prize pool. It can be double the buy-in (remember, UFC Spin & Go’s are winner-take-all). Or you could watch it spin up by the thousands, cranking up the drama in the process. Again, whether that’s Junior dos Santos drama or Nate Diaz drama, is down to you. And that goes for any game, whatever the buy-in. You might be a first timer making your debut in a $0.25 UFC Spin & Go, with a top prize in the thousands. Or you might be playing $5 and $25 games, with first prizes tapping out at $2 million and $3 million. Either way you get action, excitement, and a potential big payday. And like a round in a UFC fight, all in the space of a few minutes. Off the tables, you’ll also spot PokerStars on the canvas of the Octagon™ at UFC 236 in Atlanta on April 13, 2019 and again at UFC 237 in Rio on May 11, 2019. And from there, all major UFC Pay-Per-View events throughout the year. It’s an exciting time for UFC and poker fans. “UFC is the perfect pick for PokerStars,” said Christopher Coyne, Chief Marketing Officer, Stars Interactive. We’ll have more details of giveaways and competitions in the coming weeks. But what we can say is you’ll have the chance to experience the UFC close-up. That goes for whether you’re a long-time fight fan, or getting your first glimpse at the Octagon™. And it all starts soon. PokerStars is launching a major UFC ticket and VIP experience giveaway for Brazilian fans ahead of UFC 237, one of the MMA world’s biggest cards, which takes place in Rio next month. We plan to be there to celebrate. The keep an eye out for special promotions across social media, and here on the PokerStars Blog. For now, you can start playing UFC Spin & Go’s within minutes on PokerStars. And for as little as $0.25 (call it our equivalent of Strawweight). You’ll need a PokerStars account, which you can open in just a few clicks. Get started here. Follow the prompts and find these new games in the UFC Spin & Go Tab. From there you can select games, and take a seat. And if you need a little help, a few words of encouragement from your own corner (think John Kavanagh or Greg Jackson), then PokerStars School will teach you how to play, and win, as you start your UFC Spin & Go career. So, that’s fast-paced action, with all the drama and excitement you expect in poker and UFC. Catch up on all of this week's content right here.